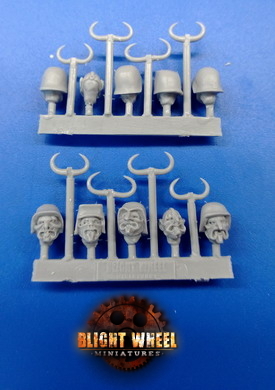 This set contains, 5 heads face mask with fangs or hornss, cast in resin, designed to fit 28mm "heroic" miniatures, supplied unpainted, with no base. Compatible with Blightwheelminiatures models and most heroic scale plastic/metal troops. © 2012 blightwheelminiatures. All Rights Reserved. Powered by JumpSeller.